You are here: Home » Sometimes I’ve believed as many as six impossible things before breakfast…. Breakfast is my favorite meal of the day, so naturally, I’m always in for a good brunch. I love snacking on all of the sweet breads, muffins, scones, etc. but my true brunch love is eggs. An egg dish is both satisfying and yummy in my tummy. One of my go-to egg dishes for brunch that always gets rave reviews for it’s taste and presentation is my Eggs in a Basket. 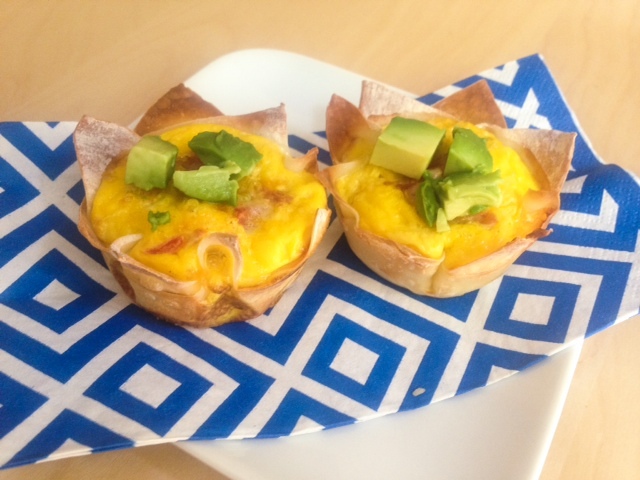 Eggs in a Basket are cute little individual quiches that you can customize however you like. I’m a big spicy foods fan so I typically will make my Eggs in a Basket with jalapenos, bell peppers, avocados, etc, but I’ve also made them with oven roasted potatoes and bacon. These lil babies are super easy to make and are sure to be the talk of the brunch table. Enjoy! Prepare cupcake baking sheet with non-stick cooking spray. Place a wonton wrapper in each cupcake tray, then place another one on top of each wrapper at an angle so all of the points show. Put a little cheese, bell pepper, jalapeno, sauteed onion, and stewed tomatoes with green chilies in each cup. Crack 8 eggs into a larger glass measuring cup and whisk. Then pour eggs over each cup until filled. Top with a little more cheese. Bake for 20 minutes then serve immediately. Tip – Use a spoon to help slide these out of the cupcake dish. Top with fresh avocado and hot sauce. Amy, these look awesome. We definitely need to try this recipe!